Started its production journey back in the start of 2003, Mitsubishi Outlander was born as a SUV. At that time most of these SUV’s were good in handling and comfortable on road, but showed poor results off road. Although the first generation of Outlander was bit weak to its competitors, but the second generation was up to the mark of perfection. With the option of third-row seat and V6 engine, the Outlander reputation as a small SUV was changed into all-wheel-drive competitive SUV. With distinctive styling, advance technology and lively personality, it is no doubt number one choice of consumers today. In case of 2010 Outlander, the car has a lot of new things to ponder. Major advancements include new LCD gauge display, Fuse hands-free link system, voice command system and real-time traffic navigation system. Other than these technological progressions in the technical features of the car, the new Outlander has V6 engine in its hood, in addition with a top of the line GT trim level. The new Outlander comes with four trim levels: ES, SE, XLS and GT. The normal models include the ES and SE which have a 2.4-liter four-cylinder engine generating 168 horsepower and 167 lb-ft of torque. Whereas in case of XLS and GT, they are powered by powerful 3 liter V6 engine producing 230 hp and 215 lb-ft of torque. The four-cylinder has a CVT, while the XLS and GT have normal six-speed automatic. Moreover for further specification in hood type, all four trim comes with front-wheel and all-wheel-drive. The Outlander starved of any uncertainties, is great when it comes to fuel efficiency. In case of two wheel drive version, the mileage is 27 mpg on highway, which only is 2 mpg higher than the four wheel drive option. In case of the powerful V6 engine, the fuel consumption is better than many competitive make. The XLS and GT is more capable both off and on road, and with a consumption of 25 mpg highway, it is a car what one can just dream off. 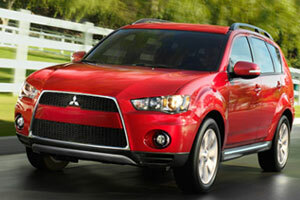 Ranked on top spots when it comes to safety features, Mitsubishi Outlander covers all your insurance for safety. From ES to SE and XLS to GT, all the models are equipped with full array of safety features, focusing on customer care first. So one thing is sure, for Mitsubishi safety is primary feature. In case of interior, this car has it all. The basic ES model is equipped with features including cruise control, full power accessories and full array of safety features, very rare in base trim level of competitors. In SE addition, the Mitsubishi has fitted keyless ignition/entry, a six disc CD changer and steering wheel mounted paddle shifters. The XLS has Fuse hands free, chrome accents and voice-activated Bluetooth phone connectivity. Last but not the least, the top of the line GT gets xenon headlights, aluminum pedals, rain sensing windshield wipers and satellite radio. All the four trims are best response to their price tags. 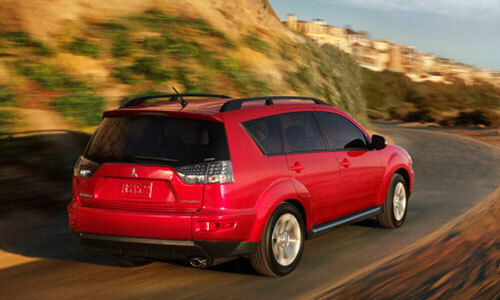 In addition to the above extraordinary features, many of the options by Mitsubishi include package deals. These grouped package deals comprise of sunroof, the upgraded audio system, a hard drive based navigation system, leather fabric, front seat heaters and a power drive seat. Other than these group options, there is stand-alone option of rear seat entertainment system to take full advantage of comfortable drive with fun and enjoyment. All in all, Mitsubishi Outlander is an engineering whiz. With its energetic V6 engine and a family friendly design, this car has it all for a family. It is not just a SUV, with its moderate sporty handling and immaculate control; it’s a solid contender of its class. So if you are looking for a car which is stylish, modish, fun to drive and durable both on and off road, Mitsubishi Outlander is you choice.